The La Quinta Inn & Suites Santa Rosa has been awarded the 2016 TripAdvisor Certificate of Excellence award. 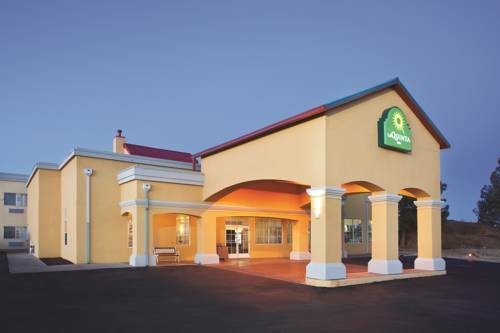 Situated on the highest point in Santa Rosa, New Mexico, and only 1.5 miles from the famous Blue Hole, the newly remodeled La Quinta Inn & Suites hotel in Santa Rosa offers breathtaking views of the city and nearby Pecos River Valley. Don't just pass through on Route 66; visit Puerto De Luna Historic Village. Scuba dive the geological phenomenon Blue Hole. Spend the day at Park Lake Recreation Area or Santa Rosa Lake State Park. In just a short drive, reach the grave of Billy the Kid, the Frontier Fortresses at Anton Chico, and Ft. Sumner State Monument. There are places to shop, several restaurants in the area, and always something happening at the nearby Santa Rosa Multi-Purpose Center. Samsung Flat-panel 40" TVs with 30 channels of HD programming. Easy-access Plug-and-Play feature makes it simple to connect electronics. Colorful and comfortable, all rooms at the La Quinta Inn & Suites Santa Rosa include free high-speed wireless Internet access, data port telephone with voicemail, and other extras. We have a heated indoor pool and a resort-style whirlpool for your enjoyment. Enjoy a Free Bright Side BreakfastTM prepared for you by our friendly staff. We are one mile east of downtown Santa Rosa off I-40 (exit 275). Stay at the La Quinta Inn & Suites Santa Rosa hotel if you are visiting Luna Community College, Guadalupe County Medical Center, and the Army National Guard Armory.